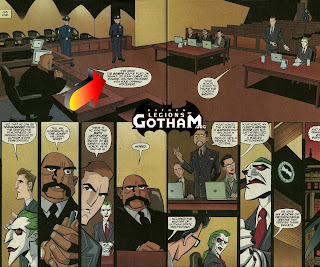 Legions of Gotham began to be featured in Batman comics a number of years ago. 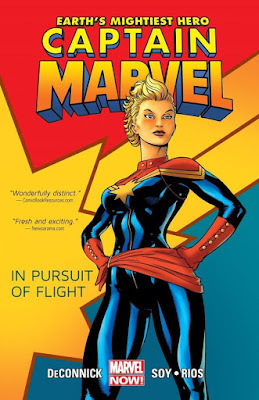 A few of our friends in the industry were kind enough to pay tribute to the fans and our site. 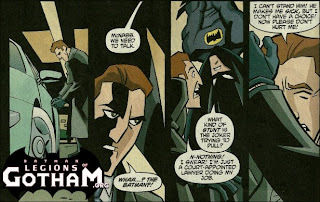 The first easter egg was Batman Strikes artist Christopher Jones placing the logo from our forum 'REPLY' button as the "The End" logo of each issue of the Batman Strikes for several issues. He did this is a nice nod to the thousands of fans and good times spent on our message boards. (see pic below). You can still find Chris lurking around the boards, when he's not busy working on comics! Thanks Chris. LOG was famously the homepage for all things 'The Batman'. We were very closely tied with the show and were able to bring the fans hundreds of exclusives in relation to the production. 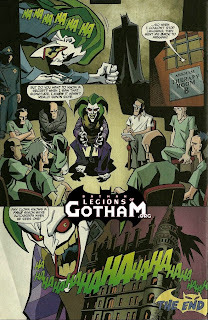 In issue #9 of the Batman Strikes series our pal and cartoon/comic book writer Bill Matheny decided to include Legions of Gotham owner Matt MacNabb in the storyline. See pics below. Thanks again Bill!